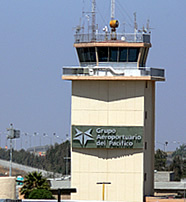 Tijuana Airport is located in Tijuana, Baja California, Mexico, and its coordinates are 32°32’27°N 116°58’12°W. The runway runs from east to west, and is roughly 300m to the south of the border with the US. Planes normally approach the runway from east but when the Santa Ana wind is blowing the approach is done from west. In Tijuana the timezone is America/Cambridge Bay. Sunrise happens at 07:45 while sunset is at 18:16. On a map of Tijuana you will see the following populated areas: Agua Caliente, Aguaje, San Ysidro, Bandini and Colonia Ruben Corona. There are a number of parks in the Tijuana area including Larsen Field, San Ysidro Community Park, Pacific Gateway Park, Palm Ridge Park, Howard Lane Park and Silverwing Park. The notable natural features in the area are South Rim cliff and the Rio Las Palmas stream, as well as a number of valleys including Spring Canyon, Wruck Canyon, Finger Canyon, Dillon Canyon, Moody Canyon and Dennery Canyon.